Watch how many Mustang owners emerge from their cockpits with red faces demanding a rematch. 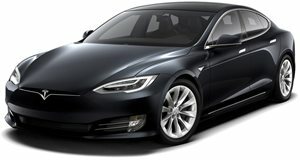 Given how Tesla is at the cutting edge of the technology that powers its cars, there aren’t too many ways to modify one of its electric machines so that it delivers more power or goes faster than it already does, which is pretty darned fast in case you haven’t been keeping up with things. By no means, however, does that indicate an owner can’t pull off some old school modifications that don’t involve tampering with the drivetrain to make the sedan faster in a straight line. One of the guys behind the Tesla Racing Channel taught a handful of cars that lesson the hard way by bringing his sleeper Model S P100D to the makeshift drag strip (read: empty streets) so they could give a firsthand account. It’s not like the Model S P100D needs much help anyways. Countless YouTube videos and Tesla’s own on paper figures prove how the all-wheel drive electric car can keep up with the world’s quickest and most powerful supercars in the quarter mile and earn the title of being one of the best sleeper sedans on the road. Only thing is those numbers are derived on Teslas that weigh as much as a small elephant. That’s not the case here. In pursuit of better times, this owner has gutted their Model S of any interior bits, preserving only the front seats, hardware, and dashboard to cut out between 400-500 pounds. Obviously that pisses off some prideful Mustang owners, but at least this Tesla driver can ask who the real American muscle car is now?